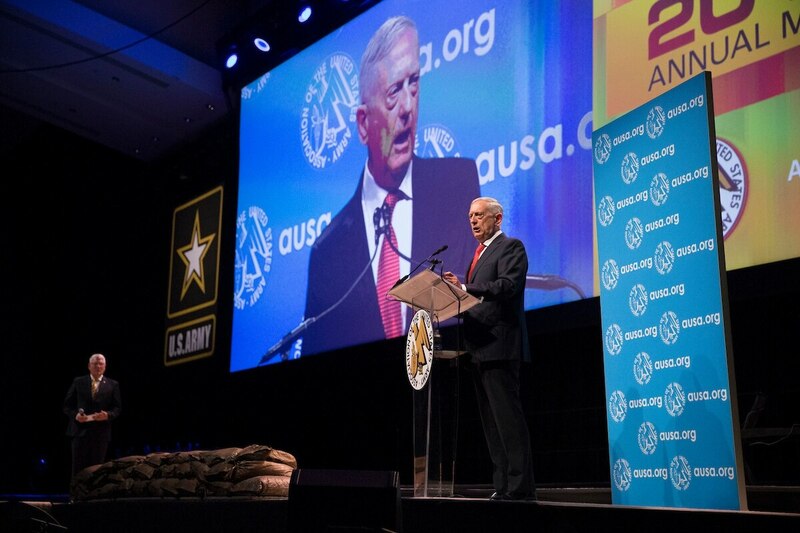 Secretary of Defense Jim Mattis tells troops their job during diplomatic efforts with North Korea is to 'be ready' to provide a military option, during a speech at the Association of the United States Army's annual conference on Oct. 9, 2017, in Washington, D.C.
Click here for more coverage from the AUSA 2017 conference. There is a belief among experts that North Korea will attempt some kind of launch or detonation late Monday, timed around a local holiday. As of publication, weather reports show non-ideal conditions for a launch, which may delay whatever show of force is being considered from Pyongyang. In contrast to some of the president’s tweets, Mattis’ comments represent a fairly regular baseline of the North Korea situation — that diplomacy has the lead, with the military ready to back it up. Readiness for a major conflict was a theme throughout the secretary’s speech, which burrowed into the Army’s history and came with a series of book recommendations. The big takeaway, Mattis emphasized, was that the Army needs to be ready to go at a moment’s notice because if diplomacy fails, the military must be deployable right away. Diplomacy, and allies, were also a theme of the speech, with Mattis noting that while he has “had the honor of fighting many times for America,” he never fought in a purely American force structure. “From NATO to Europe to the Pacific, our message to our allies is ‘we are with you,’” Mattis said. America has no “god given right” to victory on the battlefield, and Congressionally-imposed budget caps are putting the nations’ dominance at risk, Secretary of Defense Jim Mattis warned Monday.